WELCOME TO Just Say Yes! I’ve seen people give up on the church, not because they abandon their faith or disagree with our mission, but because they feel stifled, restrained, shut down, and closed out by archaic and impenetrable systems and by defensive and controlling leaders who are averse to change. 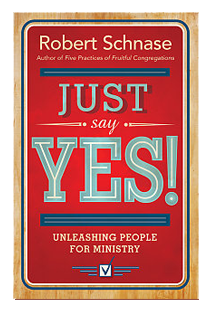 My prayer for Just Say Yes! Unleashing People for Ministry is that people whose passion has been simmering for years, who yearn to be told Yes will be given new hope through practical ways church leaders can rethink fundamental assumptions about organizations and leadership. Learning Time at Kirkwood UMC, Feb. 21, 2016 @ 2-4:30 p.m.